Quite often mobile office trailers are set up on undeveloped job sites where there is a lack of water and sewage connections. This can create a dilemma for those looking to use their internal restrooms. 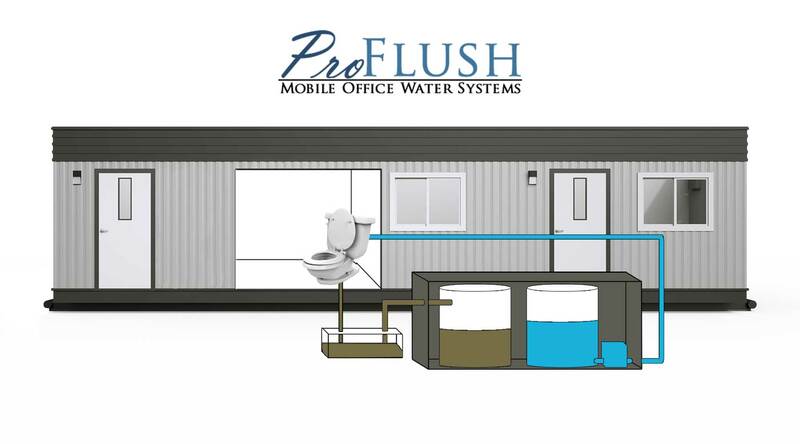 To assist, we’ve developed the Pro-Flush Fresh Waster System. This fully self-contained portable water system provides contractors with the necessary connections their trailer requires without having to tie into city water and sewage lines. Servicing your Pro-Flush system is essential to keeping it operational. Services can be scheduled daily or weekly. With each service, our technician will replenish your water supply, evacuate the waste tank and inspect all elements to ensure they are kept in proper working order. These variably sized tanks act as your reservoir and are discreetly mounted within an insulated box and positioned on the outside of your trailer. This protects the tanks from the elements and allows us to perform all services from outside. This system utilizes a 115V water pump to maintain water pressure throughout the entire trailer and operates on demand at exceptionally quiet noise levels. The waste holding tank is discreetly kept out of sight within a service box to prevent unwanted tampering and to keep it out of site to the general public. On the side of this box is a special valve which gives our drivers access to evacuate the tank each week.